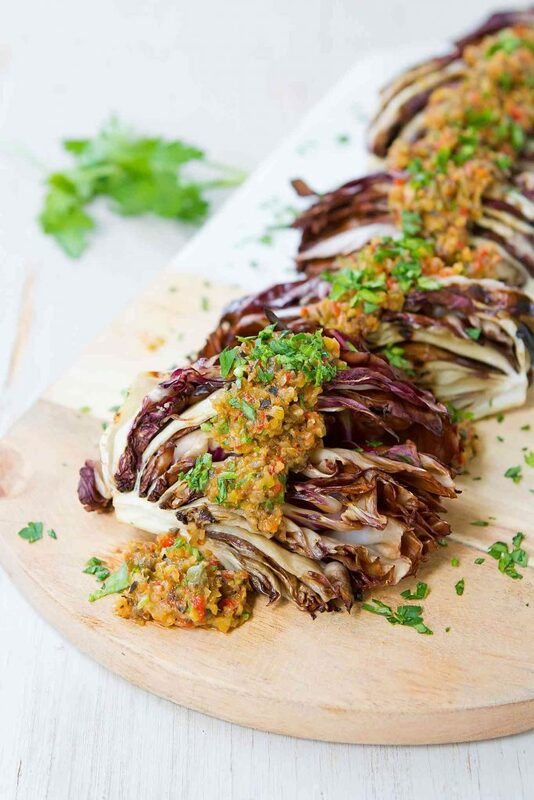 This smoky grilled radicchio is dressed up with an easy olive orange tapenade that is bursting with flavor! 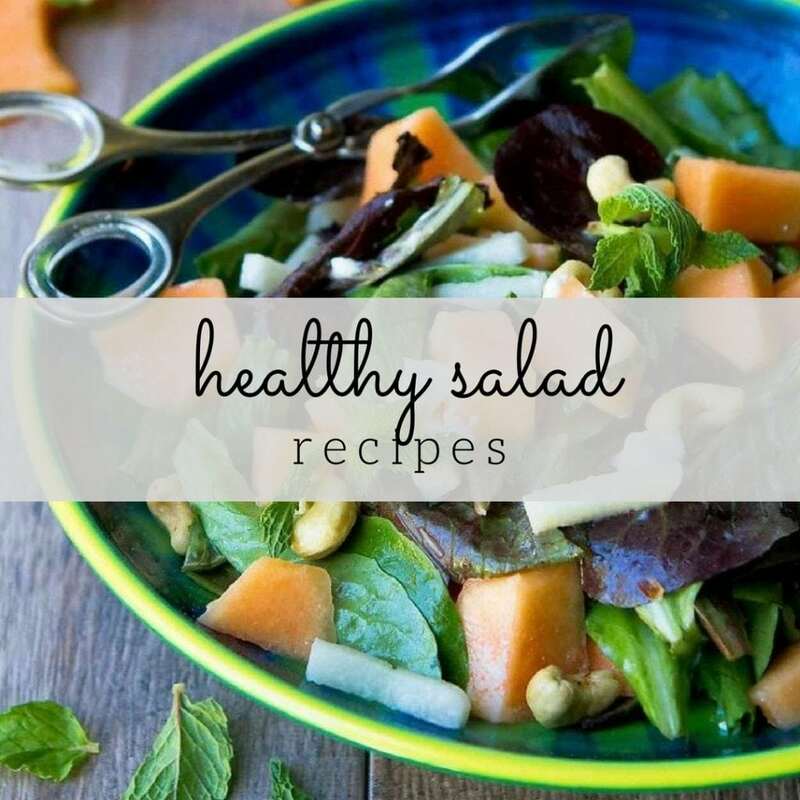 Thank you to California Olive Committee for helping me share this recipe with you. Years ago, friends of ours lived in Napa for a couple of years, working in the wine industry and enjoying all that the beautiful valley had to offer. 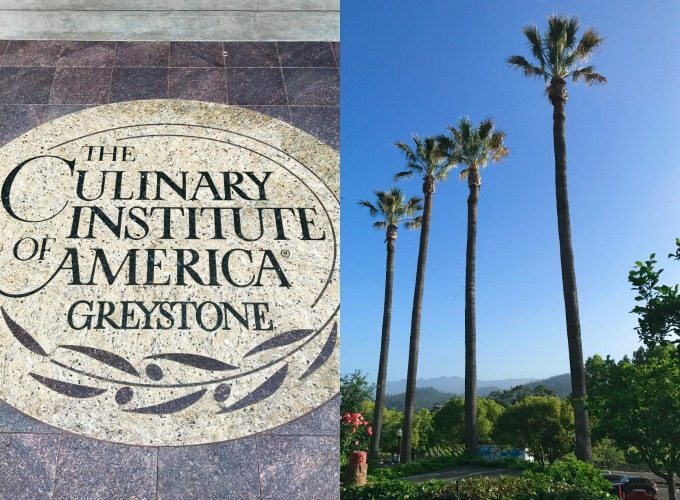 My girlfriend adores good food and cooking as much as I do and had the opportunity to take some classes at the Culinary Institute of America (CIA) at Greystone, which is in St. Helena, California. 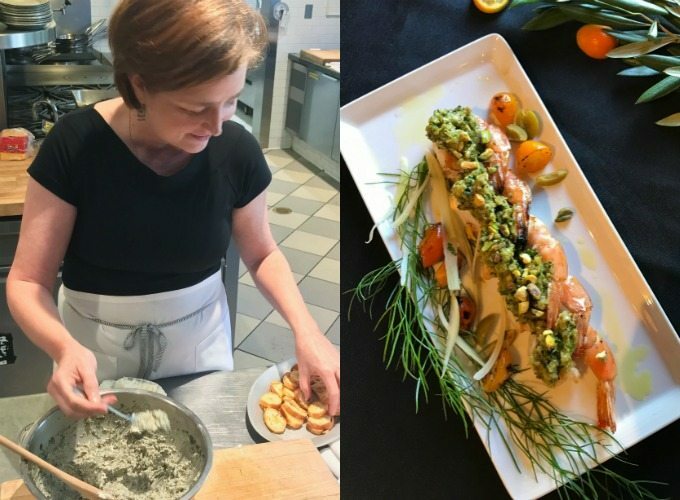 I was green with envy, listening to her experiences cooking in the professional kitchens and picking up tips and recipes that she could use in her own kitchen. Being the good friend she is, she passed on to me whatever she learned (including tricks to make the best whole wheat pizza dough), but cooking at the CIA immediately took a prominent spot on my bucket list. So, when the opportunity to travel to the CIA several weeks ago came up, I couldn’t resist. But the trip turned out to be so much more than just cooking and learning. There are some experiences that are the result of two things colliding to paint the perfect scene. For me, those two things were the CIA and California Ripe Olives. A large group of us, which included bloggers (including our fabulous host, Elise Bauer of Simply Recipes), olive growers, the California Ripe Olives team and the fantastic CIA Chef Paul Irving who kept us well fed and very inspired. Considering that olives fall firmly in my list of top 10 favorite foods, and that I’ve been eating California Ripe Olives ever since I was a kid, I was beyond excited to eat several meals starring olives in every form and to have a chance to cook with them in the CIA kitchens. One of the most amazing finds? Smoked olives! I could snack on these babies all day long. Elise and Chef Irving smoked them in a kitchen hotel pan, with wood chips underneath, but I’m going to try them on my gas grill, with one of the smoker boxes placed in the grill. I’ll be sure to report back! Learning about various ingredients and how they are grown and produced is one of the most interesting parts of my job as a blogger. We had an opportunity to learn from both olive growers and canners during the trip. California grows 95% of U.S.-grown olives, produced by the hard work of 900 growers, many of them family-run operations, and only two canners. 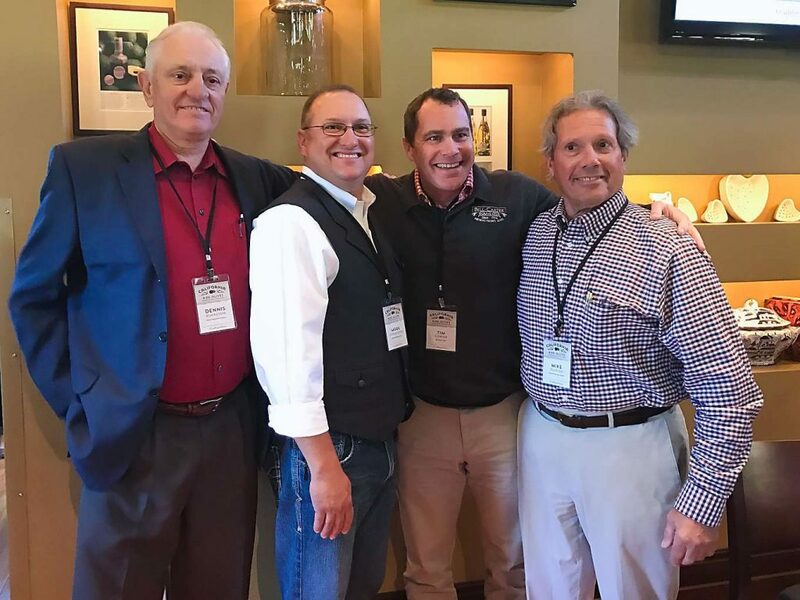 The dedication that these growers have to producing a consistent, high-quality product and their knowledge of best farming practices and food safety is admirable. 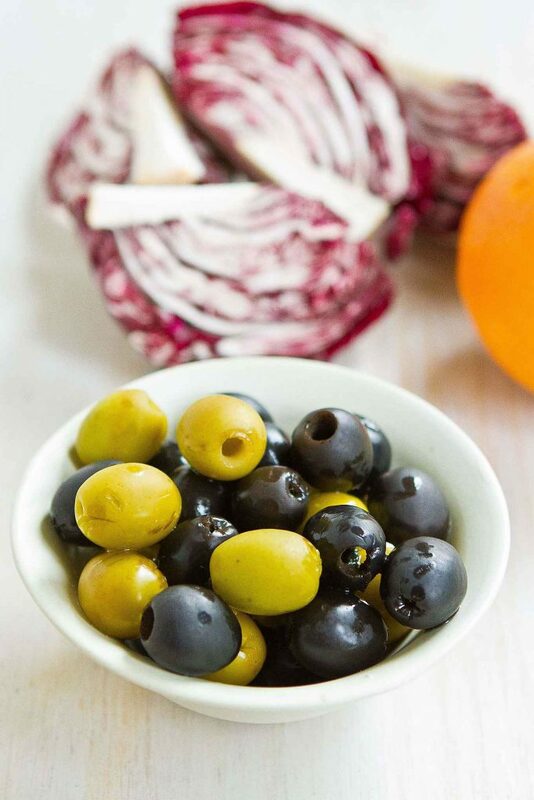 Everything from smoked olives to candied olives! The California Ripe Olives that you find in your local grocery store go through a 7-day process of curing, which takes away from the bitterness of the olives. Apparently, eating an olive straight from the tree is not something you’re likely to do more than once! And were you thinking that black olives came off the tree that color? Me too! Black olives actually turn that color when exposed to oxygen during the curing process. So, if no oxygen is introduced, they remain green. Who knew?! 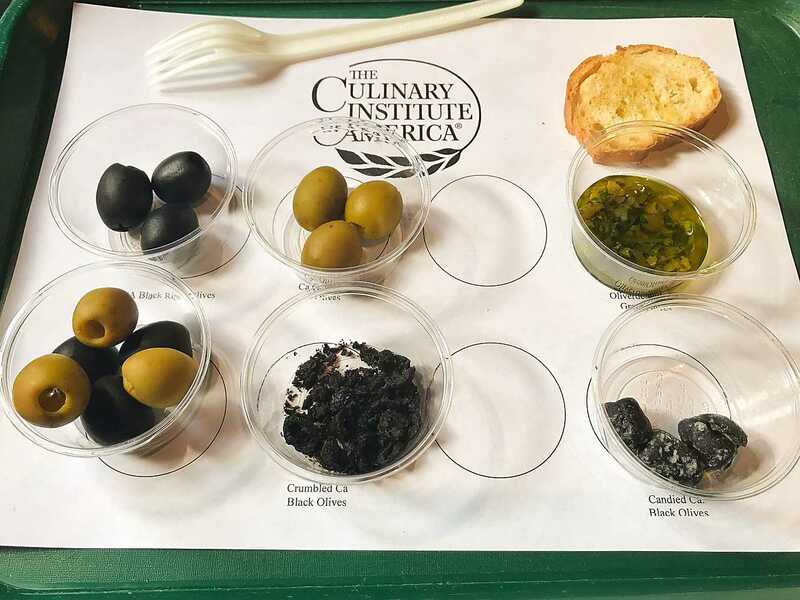 We had a chance to cook with both the green and black olives when we were divided into teams, provided with an amazing pantry of ingredients and set loose on the CIA kitchens. 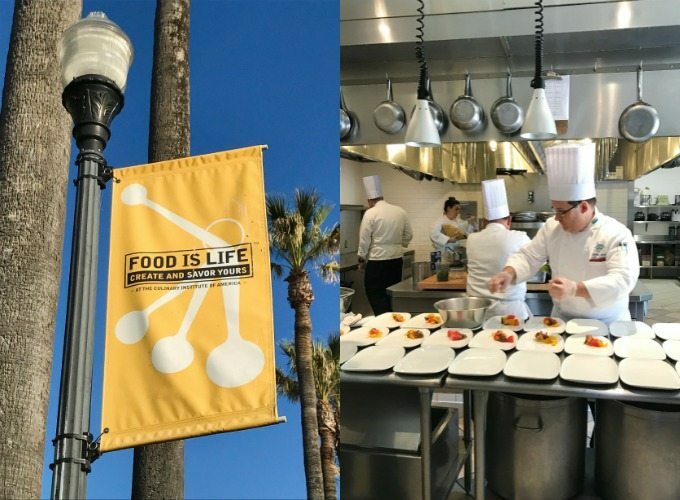 The teams produced everything from grilled shrimp with olive tapenade and pork tenderloin with an olive sauce to olive potato gratins and olive-adorned pasta dishes. Within a short period of time and just a few dishes, we managed to demonstrate just how versatile olives can be! 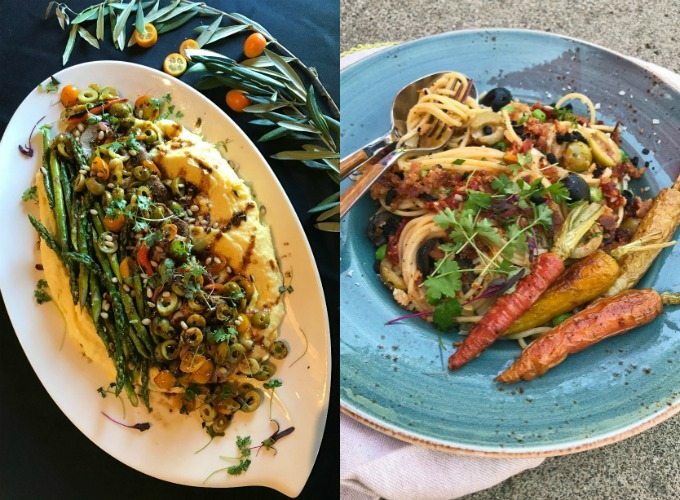 This grilled radicchio recipe, topped with an olive orange tapenade, was inspired by the olive kumquat tapenade that my team made in the CIA kitchens, as well as a blow-your-mind radicchio olive salad that we enjoyed at one of the meals. Radicchio can have a bitter flavor, but mellows somewhat when grilled. The citrusy olive tapenade spooned on top is the perfect accompaniment. I suggest making a double batch of the tapenade because you’ll probably want to spread it on sandwiches, snack on it with crackers or even mix it into scrambled eggs. 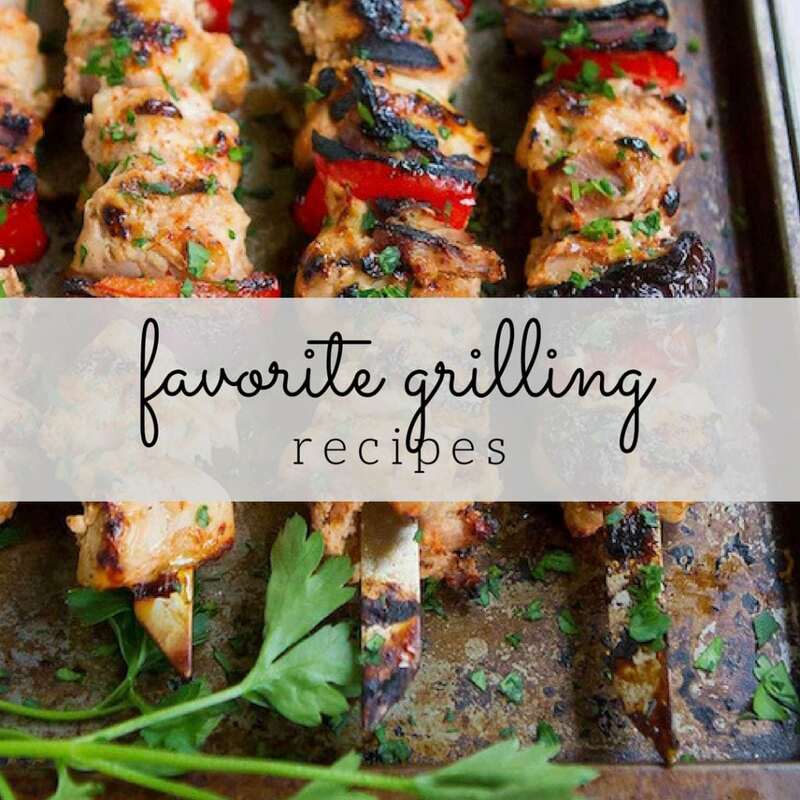 Easy as can be and so flavorful! 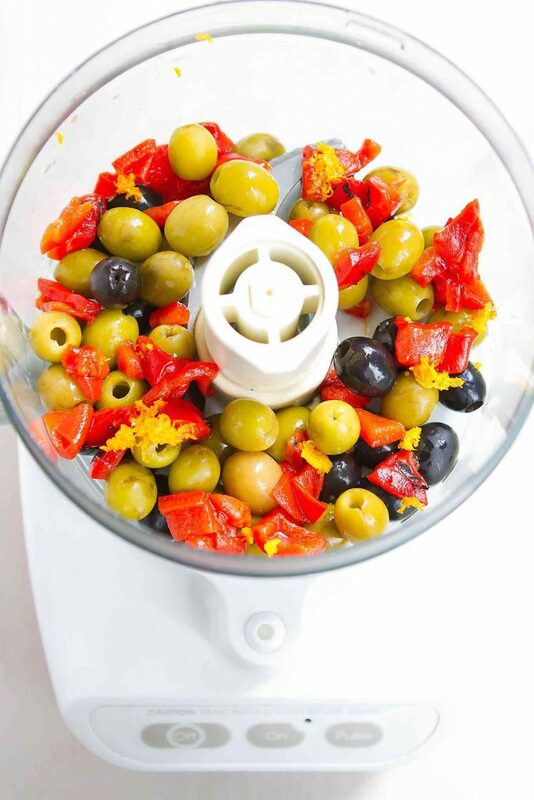 In the bowl of a food processor, combine the green olives, black olives, roasted pepper, orange zest and capers. Pulse to chop. Add the olive oil, salt and parsley, and pulse again until finely chopped. Brush the radicchio quarters with the olive, and season with salt and pepper. Grill until the radicchio is charred and the core is tender when pierced with a knife, turning occasionally, about 8 minutes total. Disclosure: This post and trip were sponsored by California Olive Committee. All opinions are my own. Any revenue made from sales through these links helps to support this blog. Thank you! We are olive lovers for sure but I can’t believe I’ve never had a smoked one. That needs to change ASAP! We eat olives all the time so I am shocked we’ve never tried them smoked! The grilled Radicchio sounds delicious too! What an incredible experience! I LOOOOOVE olives and exploring dishes from around the world featuring olives. 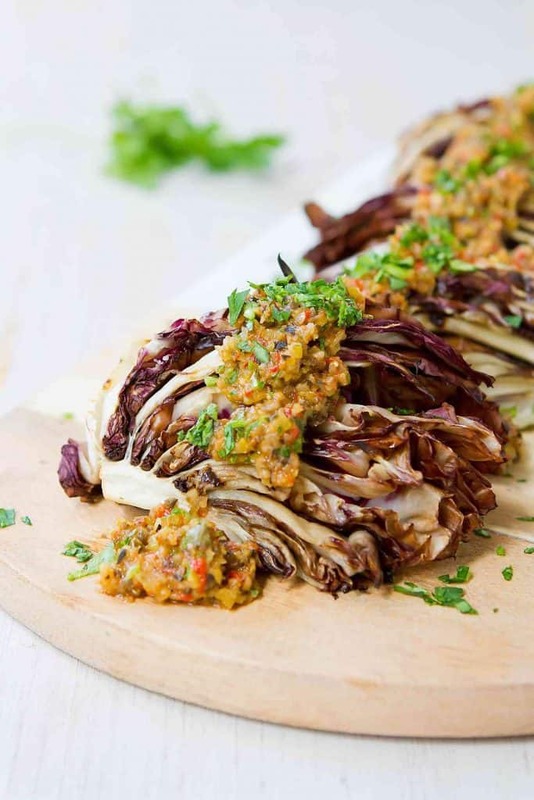 Your grilled radicchio sounds heanvely! What a fun experience!! 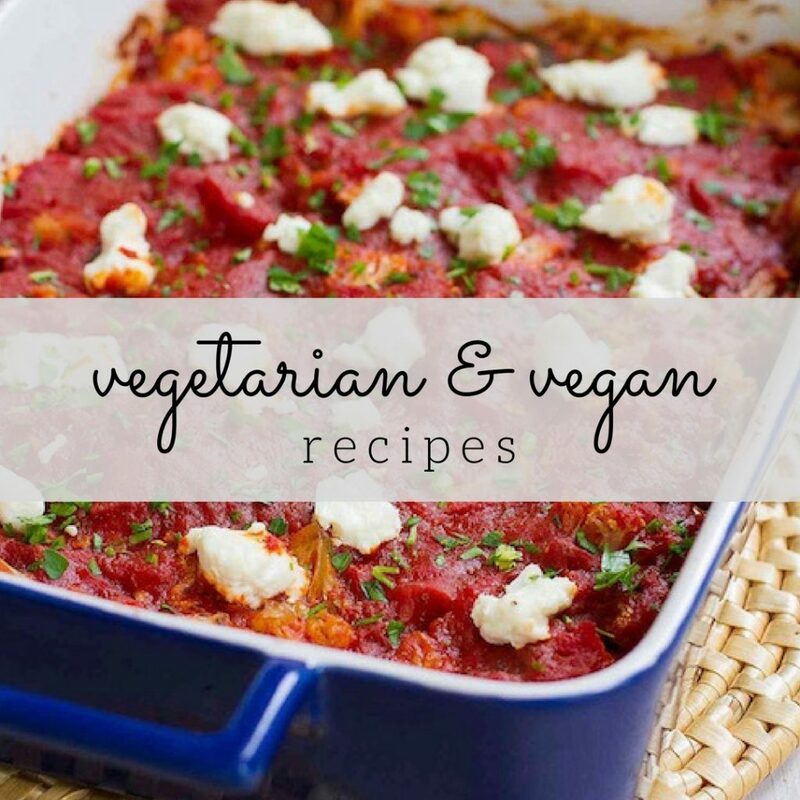 And I love this recipe – all of my boys (and husband!) LOVE olives!! Looks fabulous….I’d love to try this! What a fun experience! 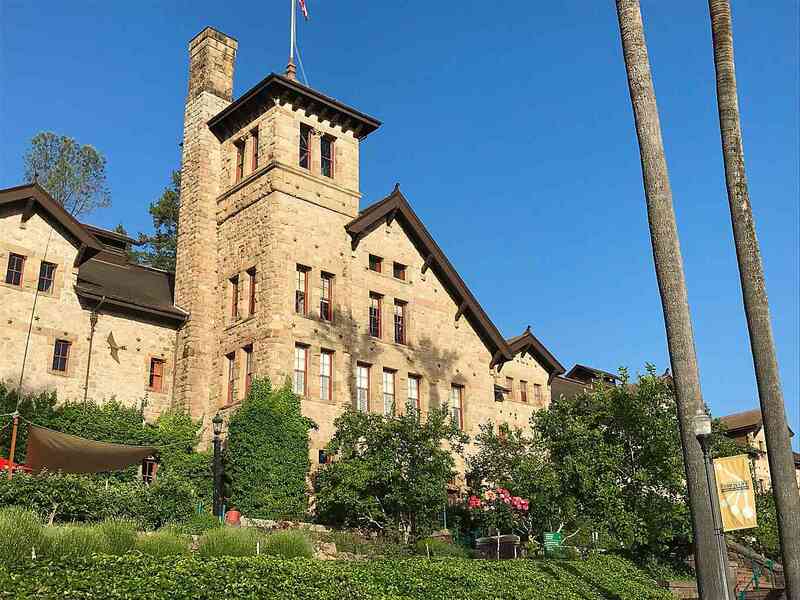 I actually graduated from the CIA at Greystone. Miss that place! This looks like such a fun experience! I can’t wait to try this tapanade recipe! 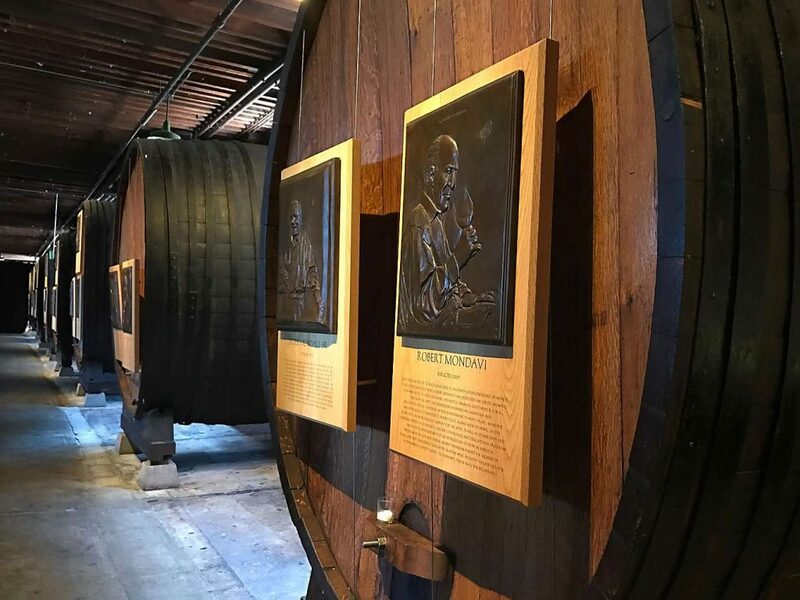 Hi Dara, what a fabulous recap of the Napa weekend! It was wonderful to see you. Love the grilled radicchio and olive tapenade! What an awesome trip! That radicchio looks incredible!